Find your perfect Lanzarote property with the team at Atlantico Homes. We are one of the leading estate agents in Lanzarote, with offices in the main resort of Puerto del Carmen. And we offer hundreds of properties for sale, encompassing villas and apartments in all of the main resorts, towns and villages on the island. We specialise in the rental and sale of property in Puerto del Carmen, which is the largest and busiest holiday destination here on Lanzarote. But we also have a large portfolio of properties for sale in Playa Blanca, Costa Teguise and Puerto Calero too, as well as most other areas. Our friendly and professional staff can help you on every step of the way if you are planning to invest in the local property market. As we have accumulated many years of experience and expertise in this sector and have helped thousands of buyers find their ideal place in the sun. Lanzarote is an ideal location for overseas investors thanks to it's location off the coast of Africa and it's amazing year round climate, factors which have helped to create a stable, year round tourist industry too. This in turn attracts millions of holidaymakers from the UK and Eire, as well as the rest of mainland Europe - many of whom are seeking good quality privately owned accommodation. By contrast in other parts of Spain and Europe the holiday rental season lasts for just a handful of months, so limiting potential returns. This incredible weather also makes Lanzarote an obvious choice for anyone who is seeking to retire in, or relocate to, sunnier climes. Atlantic Homes provides a superb service which goes from A to Z. Their support goes a lot further than just selling properties. Selling Your Property in Lanzarote? This same experience and knowledge means that we are also ideally placed to help you sell your property in Lanzarote too. 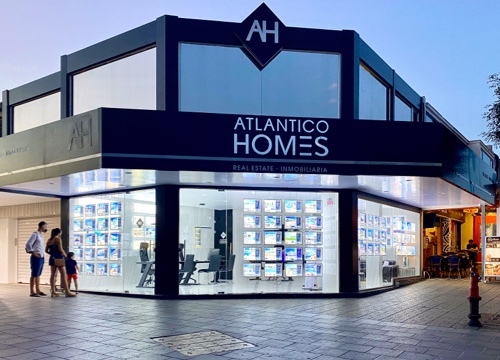 Our high profile presence in Puerto del Carmen, allied with our ongoing investment in marketing means that we are able to reach a large proportion of potential purchasers, making it quicker and easier for you to secure a sale. We also specialise in long term rentals in Lanzarote, with high quality accommodation available in all of the main resorts, such as Puerto del Carmen, Playa Blanca and Costa Teguise. Rents here are typically much cheaper than in the UK or Eire and normally require a minimum commitment of at least six months. So start looking for your ideal property for sale in Lanzarote now by using the search function or by visiting our property map page, where you can view our villas and apartments for sale by location.